[h2 display=”US Powerball Jackpot Continues to Grow” menu=”US Powerball Rolls Over”] The bad news: No one won the jackpot during the November 25 draw of the US Powerball. The grand prize was worth a whopping $148 million. The good news: Come Wednesday, November 29, the jackpot will be worth $163 million with a lump sum worth $103 million. The winning numbers were: 8-13-27-53-54, Powerball: 4, Power Play: 2x. While no player was lucky enough to win the top prize, many players won secondary prizes instead. For instance, there were three winners—from California, Indiana and Oregon, respectively—of the $1 million prize for matching all five white balls. Unfortunately, none of them opted for the Power Play, which would have netted them $2 million instead. All in all, there were 586,752 winners of at least $4 each. [h2 display=”Minnesotans Claim Nov. 18 Powerball Win” menu=”2 Claim $1M Powerball Win”] Last November 18, three players matched all five white numbers. Now, two of those players have come forward to claim their prize—and both are from Minnesota. Sobhi Elgharabawi from Maplewood and Jean Davis of Waverly are now $1 million richer. The winning numbers from the Nov. 18 draw were: 17-28-31-32-39, Powerball: 26 Had they both matched the Powerball number, Sobhi and Jean would have shared the $119 million jackpot. Still, $1 million is not a bad haul all things considered. [h2 display=”Hunt for AU Powerball Winner is On” menu=”Mystery AU Powerball Winner”] The AU Powerball draw held last Thursday, November 23 was a momentous one. Why? A very lucky player has been confirmed as the sole winner of the $10,658,989.09 grand prize. Unfortunately, no one has come forward just yet. So, if you purchased AU Powerball tickets t Chatswood Hills News & Casket Agency in Chatswood Hills Shopping Centre for last week’s draw, you might want to double check them! 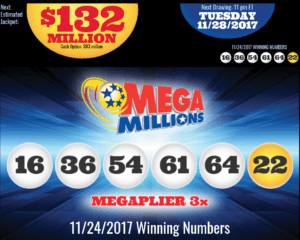 The winning numbers were: 39-17-36-35-27-33, Powerball: 7 [h2 display=”Mega Millions Rolls Yet Again” menu=”Mega Millions Rolls Again”] After several consecutive draws without any jackpot winners, the Mega Millions jackpot has rolled yet again following the Friday, November 24 draw. What would have been a $119 million winfor lucky players will now become $132 million come Tuesday, November 28, with a cash option worth $83 million. The winning numbers were: 16-36-54-61-64, Mega Ball: 22, Megaplier: 3 As for secondary prizes, no one also won the second-tier prize. However, there were over 156,461 winners of at least $4 each. [h2 display=”National Lottery Lotto Results” menu=”National Lottery Results”] If you bought tickets for the November 25 draw of the National Lottery Lotto, then you might want to check your numbers—you could be among the lucky winners! Don’t get your hopes up about winning the jackpot though, because it’s confirmed that no one won the £5,145,663 grand prize. That said, you might still be one of the winners of the secondary prizes. One player, in fact, won the £75,141 second-tier prize (i.e. by matching 5 numbers plus the bonus ball). 51 players, meanwhile, won the third-tier prize, which means each will go home with £1,550. As for the other prizes, 3,535 players won £144 each; 97,251 players won £25 each; and 1,036,352 players won a free Lotto Lucky Dip. For the Millionaire Raffle, one lucky player won £1 million. The winning numbers were: 04-07-29-45-54-56, Bonus Ball: 08 The winning Millionaire Maker code is: PINK 4936 3890 [h2 display=”Mystery Euromillions Player Wins €1M” menu=”Euromillions Player Wins €1M”] A Waterford, Ireland resident has been declared as the sole winner of the Ireland Only Raffle during the November 24 Euromillions draw. If you purchased a ticket for the said draw and you think you have no chance of winning, think again! The winner has yet to come forward, so you might want to double check your tickets. You could be the lucky winner of €1 million! The winning Ireland Only Raffle code is: I-CWQ-43032 The €7 Quick Pick ticket was bought at a SuperValu store located at Kilbarry Centre, Tramore Road, Co Waterford. 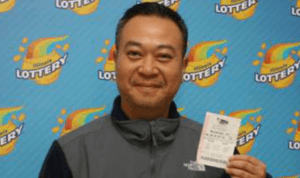 [h2 display=”Naperville Man Collects $40k Prize” menu=”Man Collects $40K Prize”] Naperville, Chicago resident Alex Seol—one of the winners during the October 31 Mega Millions draw—recently collected his winnings. Seol, who bought his winning tickets at Stop N Go in N. Schmidt Road, Bolingbrook, matched four of the five winning numbers. Had he not added the Megaplier to his ticket, he would have walked home with only $10,000 instead of the $40,000 he ultimate ended up with. The winning numbers were: 06-18-31-52-53, Mega Ball: 12, Megaplier: 4x Along with Seol, there were 8 other players who matched four of the five winning numbers. However, only 1 other player won with the Megaplier activated. [h2 display=”Machine Pulled Due to Duplicate Numbers” menu=”AZ Lottery Pulls Machine”] The Arizona lottery recently pulled a number-selecting machine due to it picking duplicate numbers. In fact, the same numbers were chosen by the machine three times in a row over the course of seven days. It was the second incident that the issue cropped up. Fortunately, for player who won something during those problematic draws, Arizona lottery will still honor any winning tickets. In addition, losing tickets played for the Pick 3 games that were held between November 15 and 21 can be refunded or exchanged. While new machines have yet to arrive, the Arizona lottery has stated that they will use the Multi-State Lottery Associations machines in the meantime. Today I purchased 3 mega millions tickets. I picked my numbers on two and asked for a quick pick on my third set of numbers. My quick pick numbers are exactly the same as one set that I choose myself. I am starting to beleive that the lottery is fixed and that I just got ripped off on my quick pick, it should have been random numbers not identical to my choosen numbers.